Accelon celebrates its annual day every year in January. This time it was a lunch at Sadanand Resorts. 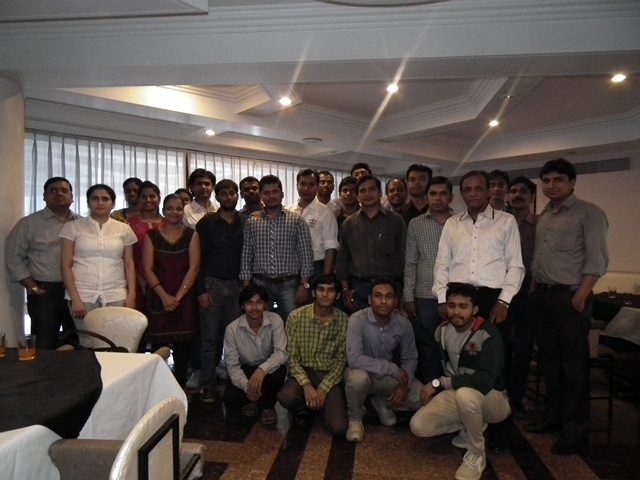 Most of our employees from Pune and Mumbai office has gathered for this at Pune. In this occasion Ms. Namita Kajave, our Director Operations, distributed awards to distinguished employees. Amol Ahuja, Principal Consultant was awarded for overall best performance. He said in his thanks note that his performance is a result of contribution and hard work of everyone. Tushar Nigudkar was given the award of Employee of the Year. He has worked hard and sincerely to complete one of the most difficult implementation. It was only with his efforts that the project has gone live. It is worth noting that he has been now entrusted to carry out an ambitious project in Africa. Madhavi Pawar, Santosh Ghogare and Prasad Kulkarni were awarded for their outstanding performance through the year. All of them have shown excellent work ethics and enthusiasm for customer service. Our CEO, Mr. Rahul Jain gave a motivating speech. He charted out the journey so far and also talked about the new arenas we are going to capture. He apprised everyone of our new overseas ventures and opportunities and also described how we are reinventing ourselves as a company involved in not just SAP B1 implementations, but in other areas like Mobile Development, Custom Applications, etc as well.